From October 1, 1986 until September 30, 1987 there was a spectacular held in Walt Disney World that would not set the standard for all celebrations to come, but is a celebration which still influences today’s annual events. 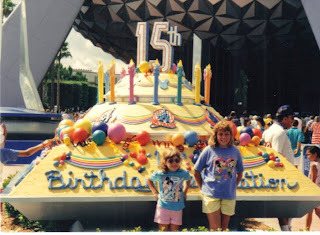 The 15th Anniversary of Walt Disney World, sometimes referred to as the 15th Birthday Celebration, was shorten and most commonly referred to as simply 15 Years, with a logo the included both Spaceship Earth and Cinderella Castle. The celebration itself had gigantic displays at the entrances to both parks. In front of the Main Street U.S.A. train station there was a large Mickey Mouse alarm clock with the number 15 filling in every spot where the 1 through 12 should be. Also in front of the station, guest could find a car from General Motors, but more on that in a bit. 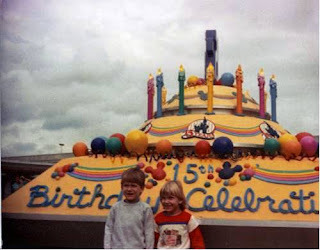 Meanwhile, over in EPCOT Center, there were massive angular cakes filling the entrance plaza. You can see the cake in the background of the photographs below, one of my sister and I and the other from the reader who inspired me to write this article. The 15 Years celebration also brought with it a great deal of entertainment. In the Magic Kingdom alone, there was a float added to the Main Street Electrical Parade as well as a stage show in front of Cinderella Castle and a afternoon parade, entitled 15th Birthday Magic Show and 15 Years of Magic, respectively. I can still, from time to time, find myself singing, “Fifteen years of magic, come and join fun…” While not designed specifically for the 15th celebration, Skleidoscope took place on the World Showcase Lagoon beginning in 1985 and ran through 1987. This spectacular used the now infamous dragon boats, as well as sea planes, parasails, sailboats, and other craft of the sea and air, as the battle between good, a la the Dreamfinder, and evil, in the form of the dragon boats, with the fate of the rainbow of color hanging in the balance. Moving back to the General Motors vehicles in front of the Magic Kingdom, the cars were there as part of a giveaway. During the 15th celebration there were prizes given away to guests every fifteen seconds. From small pins up to the vehicles, the 15 Years event had one of the best guest to prize ratios ever seen in a Disney park celebration. 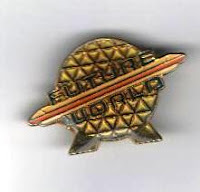 While my family never won a car, even though one was given away every day, the EPCOT Center Future World pin, featuring Spaceship Earth and a diagonal monorail, is still a cherished possession. Overall, the 15th year of Walt Disney World had quality entertainment, great prizes to be won, and decorations that did not detract from the overall park going experience. It may be because this was my heyday of visiting Walt Disney World as a child, but this celebration will always hold a fond place in my heart. Very fun post! I was 15 in 1987 and that was the year we made our last family trip to WDW. I have a scrap of a photo of my brother and sister in front of the cake. I must not have liked how I looked in it because I tore myself out of the picture.